Each fall I return to the slopes and wonder if I will remember how to telemark ski. The first run brings painful aching to the arches and a burning in the quads, but I know that it will get better on the second run, and the third, and… Curiously, the pain seemed to be shorter lived this time. Trail running has a lot to do with that. 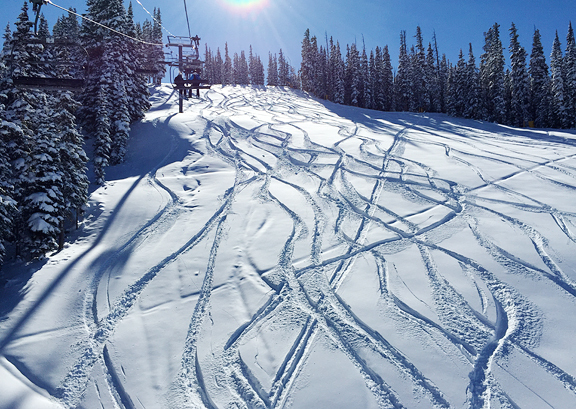 Usually our first day on the mountain (resorts) involves a lot of crappy snow, but this year’s first day was sweet. Our mountains have received a good bit of natural snow and cold temperatures for snow-making. I’m getting jazzed for ski season and all the different kinds of skiing to be done. The news is aflutter with the lake effect snow storms in western New York dumping several feet in some areas, bringing back memories of my graduate school days in Ithaca. We only got the occasional big dump snow day at Cornell and there’s something about East Coast snow that is so very different from Rocky Mountain powder. Walking to and from campus through the snow, we’d have to carry Kaweah when we crossed the roads because her paws would get wet in the salted slush and then freeze. On nights when we worked late and I was too tired to cook, we’d sometimes order takeout from Ling Ling’s which required slipping and sliding up and down snowy hills in a car that wasn’t suited for winter. Whenever anyone in my department discussed ordering from Ling Ling’s, we grad students always laughed and held an imaginary phone up to our ear, “HelloLingLing!” No matter what you ordered, the restaurant always said, “OkayTenMinute.” I was a fan of the orange beef – a Americanized Chinese food guilty pleasure. My usual rule for ordering in Chinese restaurants is not to get anything that I can make myself (and better). Living in an area that doesn’t have great Chinese fare means I’ve had to learn to make it myself over the years. Orange beef isn’t something my family eats when we get together either at home or dining out. But I go years without having it until one day we’re on the road and our only dinner option is the ubiquitous Chinese Buffet in small town after 9 pm. The orange beef in those restaurants is mostly batter and sauce and a source of tremendous regret. As with most recipes, making it at home means you can create a more wholesome version with good quality ingredients and control over the sugar and salt and all that good stuff. The original recipe serves 4 and uses a half pound of flank steak. I didn’t want to toss the other half of my flank steak back into the freezer, so I doubled the recipe. We like leftovers in this house and this reheats superbly (especially after skiing). 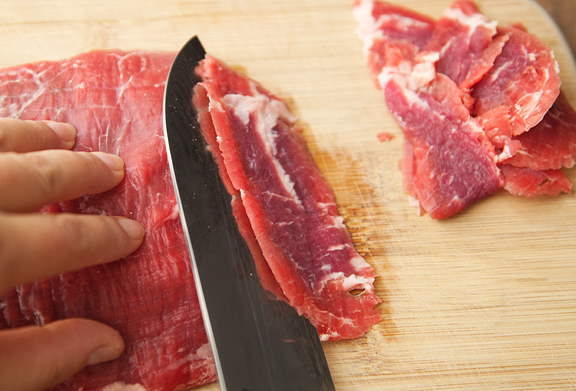 They say to slice the beef thin, but I wouldn’t go thinner than 3/8 inch because I prefer a little more bite to each slice. 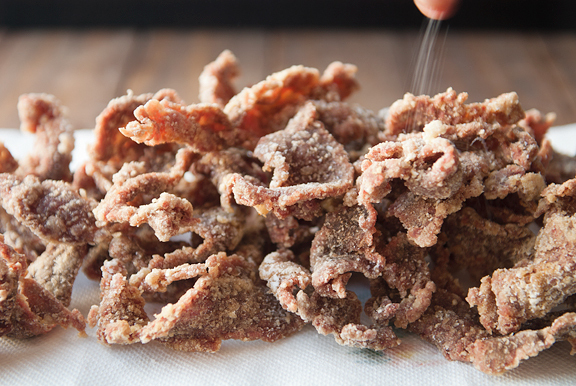 If the beef is too thin, then it just winds up tasting like fried thin thing with more crunch than chew. It should be orange beef, not orange crunch. 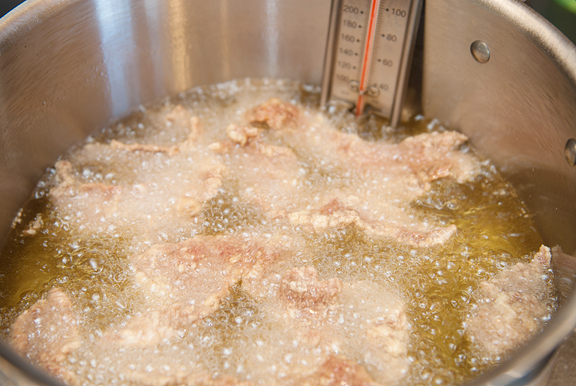 The frying is quick and will go easily if you have a fat thermometer to monitor the temperature and use a high-sided pot like a stock pot to contain splattering. You can also use a wok, but I don’t use my wok very often. Don’t fry the beef all at once, it will end badly. Fry in batches. 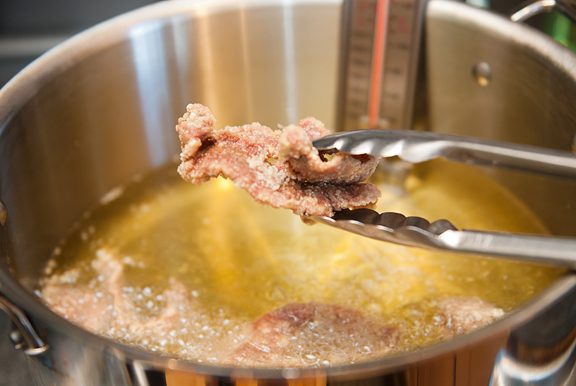 For a half pound of beef, fry in three batches or whatever capacity your pan allows without crowding. For a pound, it took me 6 batches. Once the beef is done, get the sauce going. This will take a couple of minutes to stir-fry the aromatics and then add the sauce. Be sure to re-stir the orange juice-soy sauce mixture before pouring it into the hot pan because the cornstarch will have settled to the bottom of the vessel. Once the sauce is in the pan, let it come to a boil. 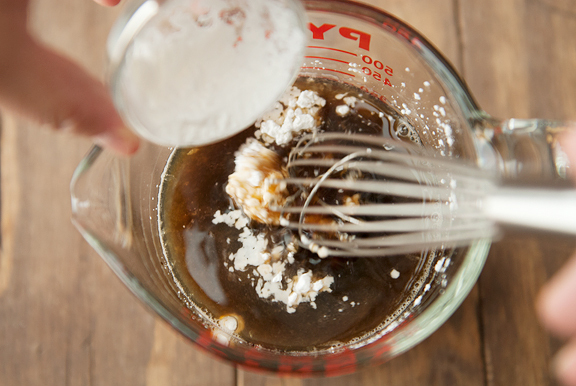 It will thicken within a minute, but give it a stir to prevent any sticking or clumps. 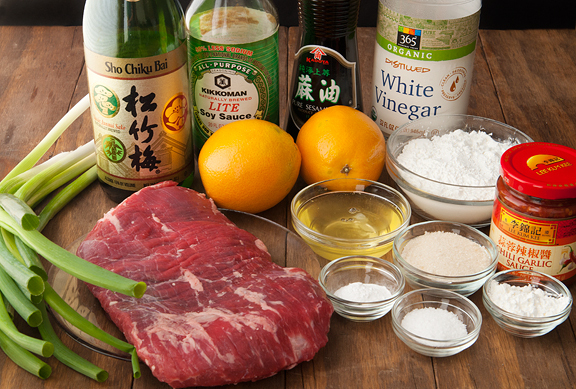 Mix in the sesame oil and then toss the beef with the sauce to coat. The home version of this recipe is great. I like that it isn’t as sweet or goopy as restaurant versions. It could use a slight reduction in soy sauce and perhaps vinegar, but otherwise the flavor is fresh and the texture is chewy as well as crunchy as well as saucy (but not too saucy). Something about fried things getting dunked in savory sauces or soups is a little irresistible for me. 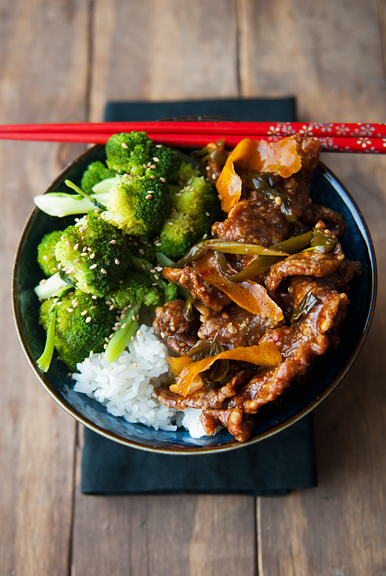 Served on steamed rice with a side of sautéed broccoli and garlic, you’ve got yourself a delicious bowl of dinner. 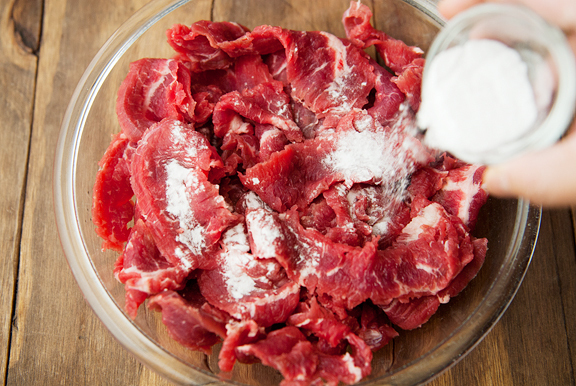 Place the beef in a shallow bowl and dust it with the baking soda. 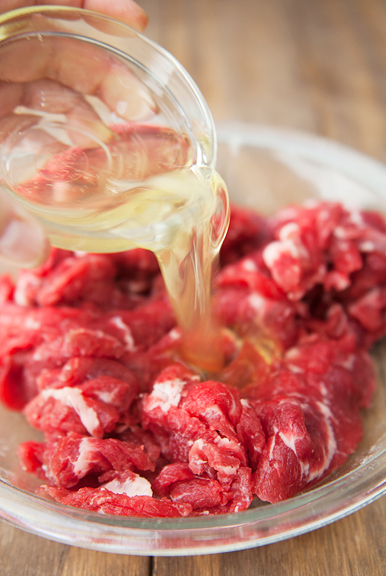 Toss the beef to coat it evenly and refrigerate for 30 minutes. 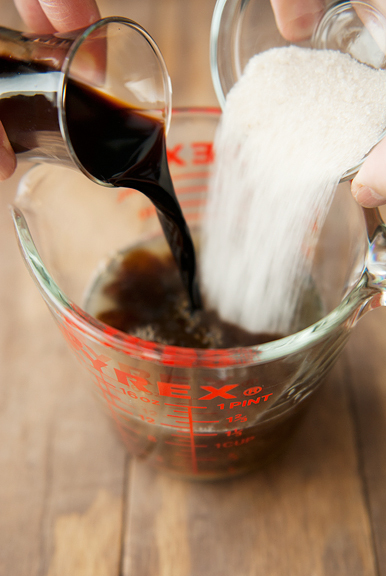 Whisk the orange juice, soy sauce, white vinegar, sake, sugar, and 4 teaspoons of the cornstarch together. 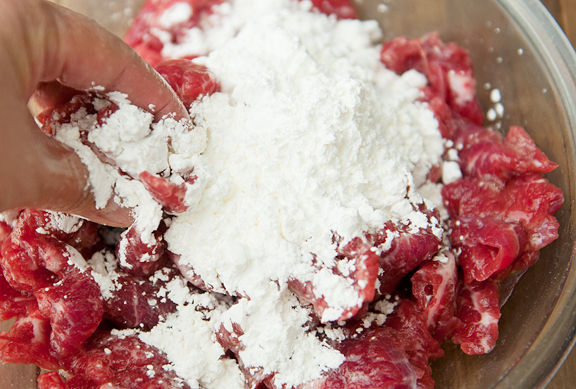 Mix the egg whites and the beef together, then sprinkle 1 cup of cornstarch over the beef. 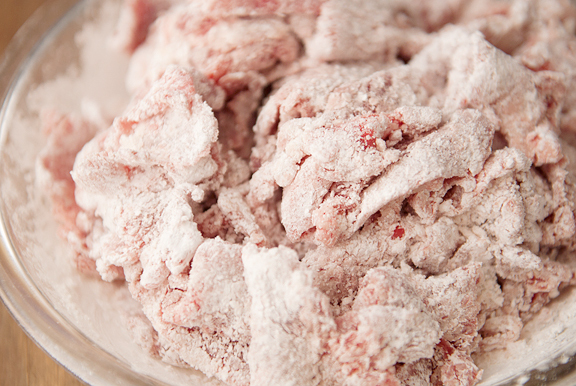 Mix the beef with the cornstarch until all pieces are completely coated. Let stand 10 minutes. 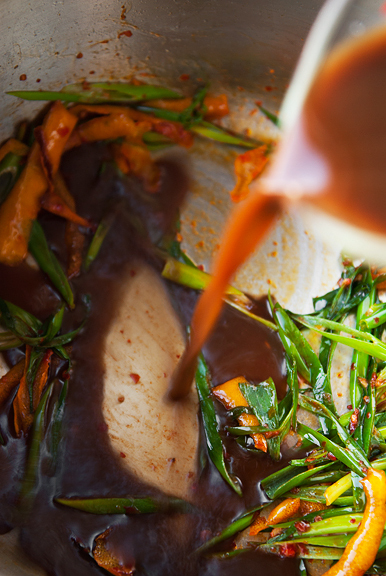 Heat the oil in a wok or a stock pot (should have 2 inches of oil depth) to 375°F over medium high heat. Fry the beef in batches (don’t overcrowd the pieces in the oil) for about 4 minutes per batch. Transfer the pieces to a paper towel-lined baking sheet or cooling rack. Sprinkle the salt over the beef. Remove all but 2 tablespoons of oil from the pan (or do what I did and spoon 2 tablespoons from the frying oil into a fresh pan) and set on medium-high heat. 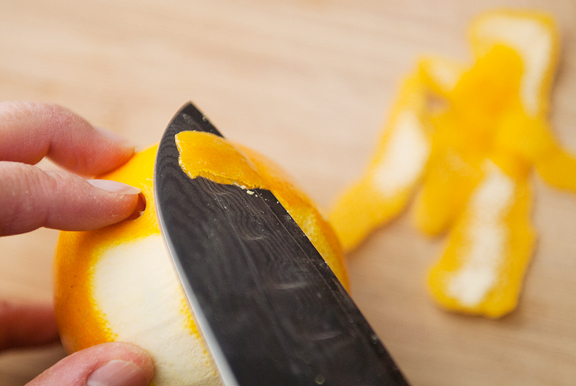 Fry the orange peel until it begins to brown at the edges (about a minute). 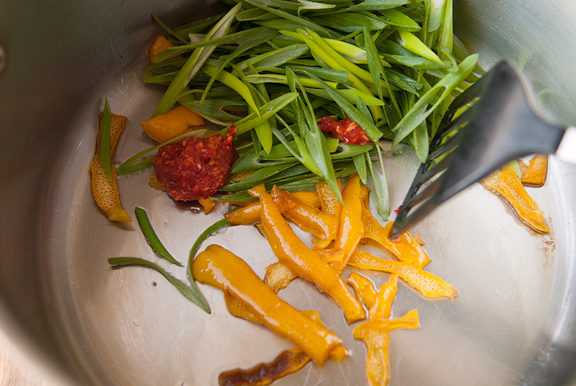 Add the green onions and chili garlic paste and stir-fry for a minute. Whisk the orange juice-soy sauce mixture to incorporate the cornstarch that settled to the bottom, and pour it into the pan. Stir and let cook for a minute or until the sauce thickens. Stir in the sesame oil. 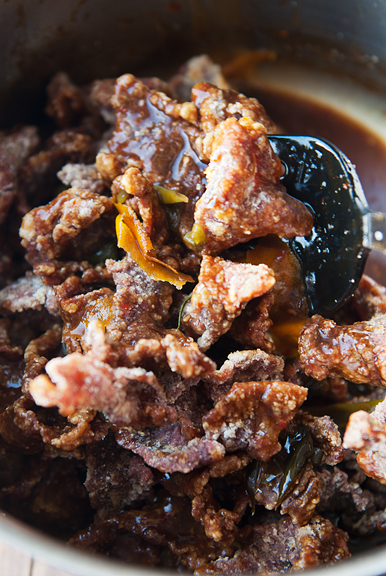 Toss the sauce with the beef and serve hot. Serves 8. Well, thank you very much. Picking up Asian food, beef, & orange loving daughter at college tomorrow, and have making menus for next week on my to do list. I was already going to make the apple cider ice cream, but really needed some ideas for mains. I saw the frying, & was going to skip this, but your comment about using your wok made me realize that we do fry shrimp in one cup of oil in our wok for a favorite recipe, so two cups really isn’t that much more! Shoot, before you know it, I will be pulling out all of your deeper fat frying recipes that I’ve rejected with regret. If only someone would clean my kitchen, including the cupboard fronts, when I fry. Maybe I need to fabricate a 4 sided structure to set on the stove…or 3, so the exhaust fan, such as it is, can deal with the steam…Thanks for the recipe & happy skiing! Yeah, the Chinese food here is pretty dismal. This looks like a terrific rendition of a dish that is often disappointing in our local restaurants! I can’t wait for ski season to start. Santa Fe is supposed to open next week, but we’ll see. We haven’t gotten too much snow yet in northern new mexico. meanwhile, we are dusting off our gear and dreaming of snow! This looks delish! I am wondering as to why the baking soda on the beef? I have never heard of this. Buffalo is our town and though we live in Niagara Falls, all our fun and good food is in Buffalo. We barely have snow on the ground here in Niagara Falls, and just a couple miles away it is seven to nine feet. This is just the worst disaster to ever hit this area. 10 have died so far and the horror stories abound. And 2 feet more come to them today to add insult to injury. Roofs are caving in, and they have been stuck home for days….food and meds running out, etc. There is nothing on record ever recorded for Buffalo like this horror. All I can say is that this is NOT NORMAL, and all should say a prayer for Buffalo and the South Towns……. We always get “Orangy Beef” at our favorite place in Buffalo, “Red Pepper” and we are addicted. 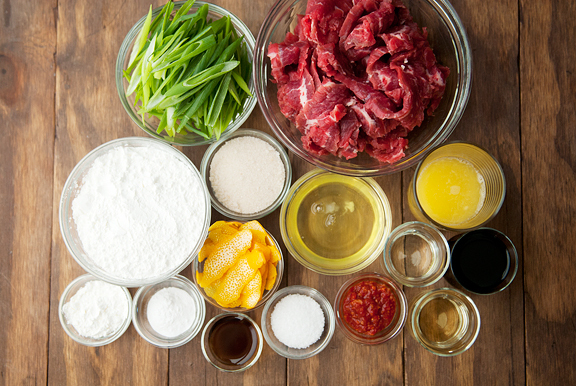 Thanks for the recipe and can’t wait to try it since it is Hubby’s favorite dish….ever! This was always my parents favorite dish! It looks so yummy :)! I love orange beef! What a great post Jen. There are no Chinese places near me so I too am forced to make my own. BTW I made the fresh spring rolls you had a while back, OMG, tasted just like the ones I get from a favorite Vietnamese place in the cities! I will be trying this. You said a couple of ingredients should be a little less could you let us know by how much? I live alone so I always have to cut recipes down to at least half. Thanks for such clear photos and instructions on your cooking! 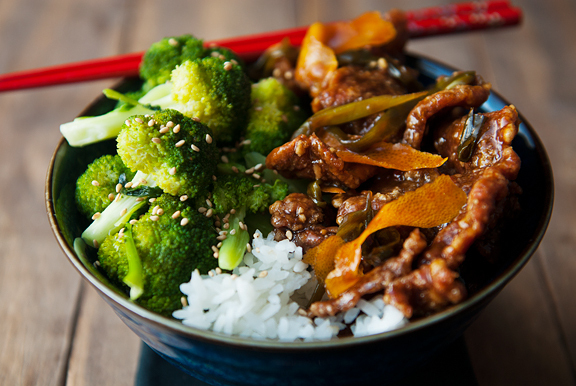 I have a good beef and broccoli recipe but will add this variation to my collection. I have chicken breasts on hand. May try it with them. Found The Kitchen Witch here today, a new blog to follow, and thinking of buffalo Joyce. Kristin – yes, I have found my greatest annoyances with frying are 1) hot oil splattering on my person 2) hot oil splattering on my kitchen. The first one is remedied with a high-sided pan (I use my all-clad stock pot) and the second is reduced considerably with a splatter screen over the pot. Meghan – doing snow dances for you guys in NM! Trudy – it’s a meat tenderizer for the beef. Joyce – hope they weather this one. Shari – I just found the sauce to be a little saltier than I would prefer. So perhaps reduce the soy sauce by a quarter? Helen – It should be good with chicken too, although I don’t know if you need to baking soda the chicken? Amy – you guys are just too cute! !